While no Caribbean teams made it to the 2014 FIFA World Cup, there are still plenty of representatives of the islands out on the field. 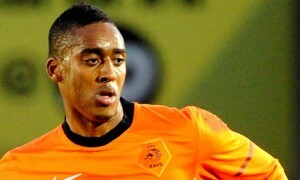 Like a handful of players from the Dutch team over the years, Dutch center-midfielder Leroy Fer‘s family hails from Curaçao. Fer expressed his desire to play internationally for Curaçao in 2008: “Personally I want to mean something for my island. That’s why I’m still in doubt. My brain says it’s better to choose for the Netherlands. Then you’re assured of a big tournament every two years. But my heart is thinking of Curaçao. It would be fantastic to play a World Cup with Netherlands Antilles, it would give the islands an enormous boost. My roots are stronger than my urge to a career, I’m striving for a higher cause. I don’t know yet, but my feelings to play for Netherlands Antilles are very strong.” However, in August 2009, Fer announced that he had chosen to represent Oranje on the international level. 1. Leroy Johan Fer was born on the January 5, 1990 in Zoetermeer, Netherlands. 2. He has the ‘sports’ gene. His grandfather played island football in Curaçao, his dad was a baseball player, his younger brother, Leegreg, is currently on the books at Feyenoord. 3. Fer joined the youth system at Feyenoord at the age of 9. 4. Fer worked part-time in the club shop before making his debut. 5. Under the management of former Dutch national coach Bert van Marwijk, Fer made his professional debut in December 2007 coming on to replace Nuri Sahin. 6. During his 4-year professional career at Feyenoord he grew increasingly frustrated about his utility player reputation as he featured at right-back, center-back, attacking midfield and as a striker. 7. Fer has various nicknames. In his youth he got nicknamed De Uitsmijter (The Bouncer) by Feyenoord youth coach Jean-Paul van Gastel for his strong physical appearance. Other nicknames are Lerra and Ferovic. 8. In 2011 he left Feyenoord to join FC Twente for a fee of €5.5 million in order to play more regularly in his favored position (central midfield). 9. He made his debut for the Dutch national team in 2010 in a friendly match against the Ukraine. 10. In 2013 he left FC Twente to join the Premier League side Norwich City for a reported fee of £8.5 million.